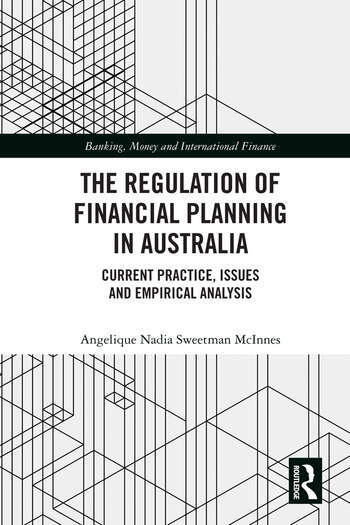 This book investigates the legitimacy of the current Australian Financial Services Licensee-Authorised Representative (AFSL-AR) licensing model, as specified in the Commonwealth Corporations Act 2001. The book rectifies the deficiency in scholarly attention to this matter by developing a new conceptualised framework for the financial planning discipline. It takes into account theories in agency, legislation, legitimacy and the independent individual regulatory regimes in other professions; thereafter integrating this framework with the financial planning theory to examine the legitimacy, or what was found to be the illegitimacy of licensing advisers via multiple third party conflicted commercially oriented licensees. This book makes a very useful reference to understanding financial planning licencing model in Australia. Angelique McInnes is a Financial Planning Lecturer and Researcher in the School of Business and Law, at Central Queensland University, Australia.